If you are building a new detached garage, workshop or outbuilding, there is no doubt you’ll have to make some decisions about the type of lighting and light fixtures you’ll want both inside and outside the garage. 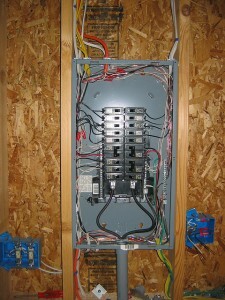 If you are planning to build using pre-drawn, detached garage plans like those offered at The Garage Plan Shop, be aware MOST, but not ALL of these construction drawings will come with a basic electrical plan reflecting the locations of fixtures, outlets and switches. It will be the electrician’s job to run the wiring and install the fixtures, outlets and switches according to local electrical codes. You will not be limited to what the floor plan suggests or recommends. As the owner of the garage, you will work out all of your lighting selections and fixtures with your builder and electrician. Take some time to review the different types of lighting fixtures you may want to include with your new garage so you’ll be prepared when construction begins. Outdoor Lighting Fixtures: A comprehensive outdoor lighting plan will achieve safety and security as well as aesthetic beauty. The lighting fixtures you choose and their exterior placement are the most important aspects of your overall lighting plan. They will enhance safety and security by lighting the walking areas and surrounding spaces while deterring unwanted visitors throughout the night. Be sure to choose fixtures that illuminate the garage door(s), service entries, pathways and sidewalks connecting to the home. Consider carriage lamps with motion sensors on both sides of the overhead garage door(s) that turn on as soon as you pull into the driveway. 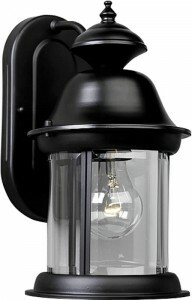 Dusk to dawn light fixtures work well for service entries, and various types of landscaping lights are ideal for lighting the walking areas. Outdoor lighting fixtures are also great for enhancing nighttime curb appeal. Strategically placed fixtures can nicely illuminate special exterior design features and decorative detailing. Be sure to choose fixtures that blend with the architectural elements of the detached garage and your home. Finally, consider landscape lighting for any special shrubbery and plantings that enhance the exterior appearance of your home. A variety of solar powered light fixtures are great for landscape lighting, they are easy to install and you don’t have to remember to turn them on every night. Interior Lighting Fixtures: Your interior lighting plan will be based on how you plan to use the unfinished space of your detached garage, workshop or outbuilding. If your garage will simply be used for parking, a centered, overhead fixture might be all that you need. Consider one that also has a motion sensor so it automatically turns on when the garage door opens lighting the way for you to safely pull the family cars inside. For those who plan to have a workbench along one wall or use the entire space for a workshop, task lighting and shop lighting should be considered. Choose lighting fixtures that will project the light directly on your workbench or work surface giving you plenty of light to work on home repair projects and hobbies. Fluorescent shop lights provide bright light for all types of hobbies, tasks and projects and are relatively inexpensive. If your detached garage floor plan offers finished spaces such as a half bath, office, game room or even an apartment, you’ll have to consider other interior lighting fixtures that are specific for the types of finished rooms you’ll have in your garage. Talk with your electrician or visit a lighting or home improvement store for more ideas on interior lighting fixtures. Before you begin buying light fixtures, take some time to talk with the professionals that will be working on your new detached garage. Come up with a comprehensive lighting plan that will accommodate your needs, provide safety and work well with your architectural style and decorating themes.